Did you know that in 2018 South Africa exported R148 billion worth of agricultural products? 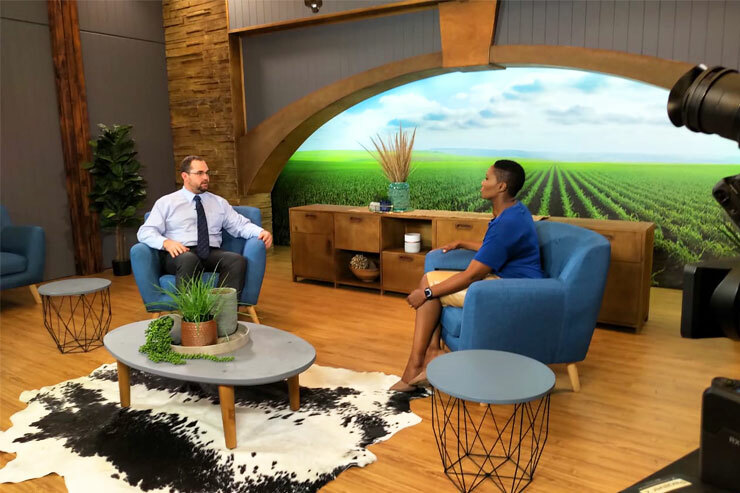 The episode which aired on Thursday, 4 April 2019 at 18:00 on kykNET, focused on the maize and starch industry. Presenter Theo Vorster was in the driving seat and took viewers through a journey of discovering new and wonderful facts about the inclusivity of the maize industry and its importance. Part of the program focuses on the Free State town of Parys. Rozanne McKenzie centers on the town, which is renowned for its art galleries, outdoor adventures and scenic views. What viewers didn’t know, however, is that Parys is also at the heart of South Africa's staple food production area. President of the Parys Development Forum, Marius Pieters talks about tourism in the area and how farmers contribute to the employment of the community and lauds agriculture as a very important part of the town’s identity. The Vredefort Dome in Paris, Vredefort and Koppies area is one of the largest impact craters on earth and is SA's seventh heritage site. Nation in Conversation pays a visit to veteran farmer in the area, Pieter van der Westhuizen. His advice is: “rather to do a small piece of justice, even if the risk is sometimes high.” Did you know, in 2017 it cost a South African farmer R1 619 to produce 1 ton of dry land maize, an Argentine farmer pays only *R880 for the same. See, you learn something new every day! The program turns to the Wholesome Foods (WFM)’s starch plant in Gauteng where Leana Barnard talks to us about maize grading and how maize starch forms the basis of many products, even braai bricks, cast iron and beer powder. Interesting! Then to put it all in perspective, Senwes CEO and Agbiz chairman Francois Strydom talks to Theo Vorster. Francois says 40% of all our protein and calorie needs are derived from maize, wheat and rice. He believes in a value chain approach and feels that each consumer is faced with a great choice every day; whether to buy a locally produced product or an imported one. The success of the maize industry lies in creating value and thereby creating jobs, increasing consumption, and further stimulating it. Grain SA economist, Dirk Strydom explains it all perfectly for the viewers. Maize starch is widely used as a thickening medium, but we also learn through the program that maize starch is also used in everyday products such as spices, glue, paints, and barbecues, and nowadays even in bioplasty and biofuels. So if you missed this first episode, you might not know everything about maize. To view the program, visit the link…. And don't miss the 13-week series on maize, raisins, onions, livestock, nurseries, forestry, beetroot, Nampo Harvest Day, wheat, cotton, pecan nuts and situs. It is broadcast weekly, every Thursday evening at 18:00 on kykNET, from now until June 27, 2019. Next week we will focus on the raisin industry and turn up in Upington in the Northern Cape. For more information or the complete schedule of this new series please visit the website www.nationinconversation.co.za.